Learn about Dominican Center's mission, values, needs, location, and history. The Dominican Center works with Amani residents and partners to build a better future. ​Urban communities all over our great nation display the scars of neglect and disinvestment of local Governments and bad policies of State and Federal Governments. Bad policies and neglect locked people of color in geographic locations, isolated them from education, job opportunities, affordable healthy housing and criminalized them for drug addiction. Years of racial injustice, subpar education, mass incarceration, poor housing and lead poisoning left deep scars: 52.4% poverty, high crime rates, drug infested neighborhoods, boarded up houses, high unemployment and mistrust. Members of the Amani community live with these scars daily while community leaders and partners constantly search for a cure/solution. ​The question stands: Who is my neighbor? When you can see your future in the face and plight of “the other” you have met your neighbor. The need of the Amani community is two fold: resistance of all racial injustice and bigotry by working for justice and giving support to community “anchor organizations” who believe and work for community sustainability through neighborhood leaders' participation in urban community decision making. The Dominican Center is asking you to join us take in a commitment that matches the long suffering of Urban communities. What you see today in urban America did not happen in 3 years. It took a lifetime of neglect, disinvestment and bad policies, and it will take a lifetime of commitments for recovery and revitalization. The Dominican Center needs your help in righting the wrongs of bad policies and disinvestment on the part of governments and the victims' poor decision making, disunity and mistrust. 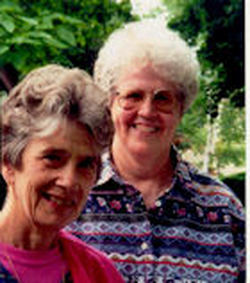 Dominican Center was founded in 1995 by Sinsinawa Dominicans, Sister Ann Halloran, OP and Sister Anne-Marie Doyle, OP (pictured below) as an urban ministry program.Their vision was to develop a holistic approach to education and women's programs in the Amani neighborhood. Sinsinawa Dominicans believe that the heart of ministry is relationships. Dominican Center realizes this by involving residents in decision-making and acting upon their concerns and preferences. Dominican Center programs have expanded beyond basic skills, to include GED preparation, financial literacy, home repairs, health and safety. In 2012, the Dominican Center was designated the lead community anchor for the Building Neighborhood Capacity Program (BNCP). BNCP is part of the White House Neighborhood Revitalization Initiative to 1) address poverty and the underlying critical and interlocking issues of education, employment, housing, health and safety in distressed neighborhoods; and 2) design and implement a resident led revitalization plan. The revitalization plan was finalized in February of 2017. Presently Dominican Center is the lead community partner for the new U.S. Department of Justice Byrne Criminal Justice Innovation Grant for Amani. The Dominican Center has a long history of collaborating with COA-Goldin Center, Hephatha Lutheran Church, Safe and Sound and District 5 of the Milwaukee Police Department. The Dominican Center partners with Amani residents to increase access to quality education, improve health outcomes within the community, and contribute to economic development . The Dominican Center supports a resident-led revitalization effort to foster social change. Dominican Center is a resource for residents in the areas of adult education, housing and building neighborhood capacity, in addition to offering support in a welcoming, compassionate and responsive environment. We believe Amani residents are experts in their own lives, experiences and needs, and can use these to positively contribute to the improvement of the community. We value the support of our donors and partners, and strive to be an accountable steward of the resources generously shared with us. The Amani neighborhood boundaries are from North Avenue to Keefe Avenue and from 20th Street to 30th Street.